The issue of religion being taught in schools has come up a few times in the last year or so and has come up again recently with the story of Jeff McClintock’s 7-year-old daughter being left in the back of the classroom while RI was taking place in the same room. One of the primary schools I attended had a Bibles In Schools programme, and even then – more than 20 years ago – it was difficult not to take part in the ‘optional’ programme. While I was opted out from the class I was made to attend on more than one occasion, and the rest of the time I was one of only a couple of students not attending. I was often questioned and confronted by others about why I didn’t attend, asked if I knew I’d go to hell and teased about my non-involvement. It’s for this reason that I became really concerned when we discovered that the school our oldest son would attend next year participates in Christian Religious Education. We’ve talked to the school and hopefully won’t have any major trouble, but it’s still forcing us to choose between making our child an outsider from the very beginning at his new school, and sending him to Christian religious education that we disagree with. 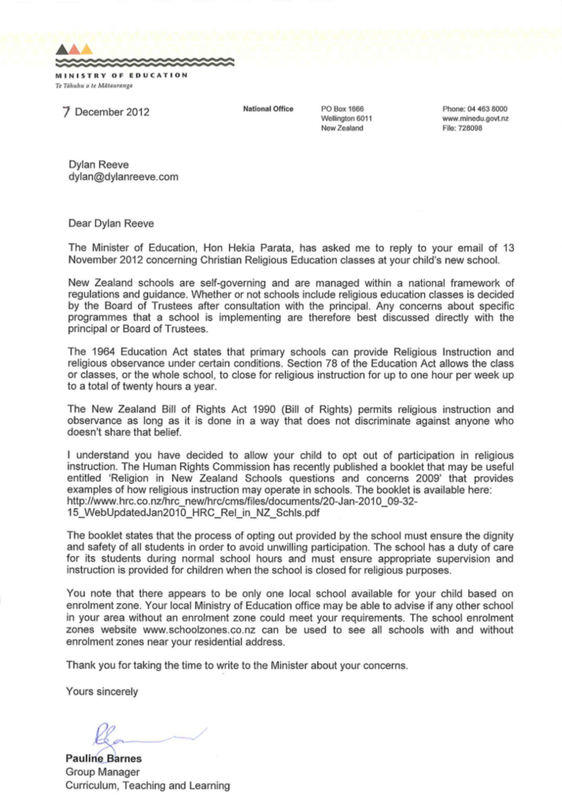 For this reason I decided to write an email to the Minister of Education about the deliberate loophole that allows schools to “close” and offer religious education. I am writing in regards to religious education in schools. We are moving house soon and as a result our seven-year old will be attending a new school. At our new new address we are only in zone for one school. While researching the school we discovered it runs a Christian Religious Education class for 30-minutes once a week. We are very uncomfortable with this. While it’s possible for us to opt our child out of this class, doing so creates and “us and them” situation. It is absolutely absurd and offensive to me as a parent and taxpayer that the school can claim to be closed for half and hour every week (while still requiring our child to be at school) and offer a program that is little more than indoctrination. I’m a writing to express my frustration that this silly loophole is allowed to continue. Over the course of a year the students of this school will miss out on 20 hours of actual classes – that is a whole week. Unfortunately we have no choice in this matter – we have to send our child to this school, and we will opt him out. We are hopefully this will not result in his being seen as different or an outsider, but annecdotal evidence from others doesn’t offer much hope. Please close this loophole. In Christian groups want to run groups within schools then it should be done in a definitively opt-in fashion and entirely outside school hours. On behalf of Hon Hekia Parata, I acknowledge receipt of your email. The issues you raise fall within the responsibility of the Ministry of Education. Therefore, your letter has been referred to the Ministry for reply on the Minister’s behalf. The Ministry will respond to you as soon as possible. Almost a month later I received a response from the Ministry. It was a letter that had been typed, signed, scanned and attached as a PDF. It also arrived rotated 90 degrees to the right – I’ve had to correct that – it’s attached below. This response completely fails to address my primary point, which is, fundamentally, that this loophole in law should be closed. Of course that’s unsurprising as the Ministry can’t change law. But the minister, who I wrote to first, can. My son starts at his new school next year, so we’ll wait and see.